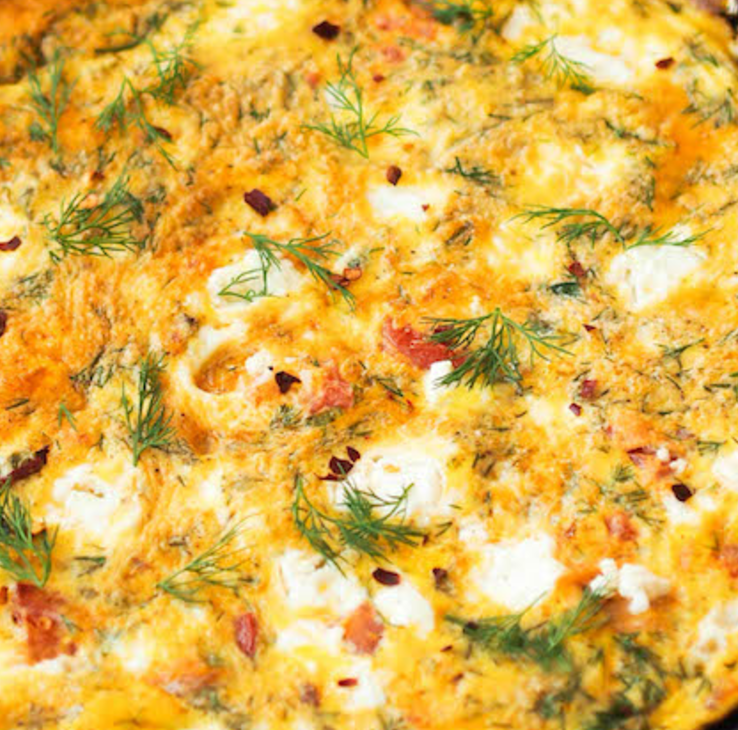 Fresh Dill and Goat Cheese Frittata! Eggs Plain organic yogurt Ghee (or olive oil) Pink salt (or regular sea salt) Goat cheese Fresh dill (finely chopped) You may want to replace or add some ingredients, for example you can use sea salt instead of pink salt, or olive oil instead of ghee. Do you like spice? You may feel like adding fresh jalapeños, cayenne pepper or crushed red chiles -- it's 100% up to you and your tasted buds! 1 - Beat the eggs with a few spoons of plain organic yogurt till mixed well and smooth (two eggs per person) 2 - Preheat your skillet on a medium fire (skillet should be hot enough for a drop of water to immediately evaporate) 3 - Put ghee on the hot skillet and let it melt, spread melted ghee over the bottom and the sides of the skillet 4 - Pour egg mixture on the skillet, distribute evenly by tilting the skillet gently 5 - Add a little bit of salt 6 - Crumble goat cheese over the eggs 7 - Sprinkle the eggs and cheese combination with chopped dill, add pepper if you would like. 8 - Cover your skillet and reduce fire to low 9 - The dish is going to be ready in minutes, stay close and touch the lid, when the lid is hot, check your frittata. It should look plump and eggs should not be runny. If there are places that look liquid use a wooden chopstick to make openings for the heat to reach the surface and cover again for a few seconds. When ready, shake the skillet to separate the bottom and slide the dish on a large flat plate.